I will admit, before 10 years ago I had never heard of Bolognese. In our house, like many other families, it was called Meat Sauce. It was my favorite version of "spaghetti." Most versions are basically browned ground beef with garlic and onions, then various canned tomatoes and dried Italian seasoning. Simple and good. Since then, I've been introduced to Bolognese. There are many different recipes for bolognese ranging from very simple with few ingredients to many with a slew of meats to create a very sophisticated flavor complex. My version is someplace in between. It is special, but simple - similar to the good ole Americanized "Meat Sauce," but with a couple more enhancements to add depth of flavor. In a sauce pan, cook pancetta, rendering fat. When almost crispy, remove the pancetta and set it aside leaving the fat in the pan. Add the ground beef and cook it until it has browned. Add olive oil and onion, cook for 3 minutes then add garlic. Cook for 30 seconds, then add red wine. Cook for 3-5 minutes on medium until the onion has absorbed the wine. Add herbs, tomatoes and tomato paste. Cook for 10 minutes until simmering. Lower heat and add cream. Cook for another 2-3 minutes at a low simmer. Remove from heat and stir in cheese. In the meantime, begin boiling a large pot of salted water. Cook pasta until it is almost done - be careful not to over cook it. Remove it from the water and place it directly in the saucepan. Stir to coat. Serve garnished with parmesan. Oh, Yum! 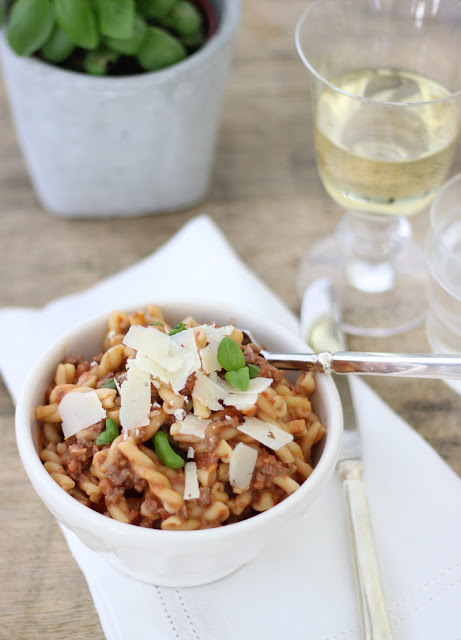 Pasta is a weekly dish in our house, and "meat sauce" is favorite. Can't wait to try your version! Looks delicious - love the pancetta!! My blog today features you! And all of your great work. Hi Jenny - Popping over from Party Resources and I'm so glad I found your blog. Loved reading about your journey to where you are today - sounds like it's been a great adventure. I just walked away from a long career in PR and Marketing (this is my first week not starting my day at a desk in an office building in years)! It's so inspiring to learn about others who have chosen a similar path and are flourishing. I hope you are loving Concord - my husband's family is in Weston and one of my dear friends has settled in Concord. I love visiting her on such a beautiful spot. I agree with you! I don't use celery and carrots in mine either. It's such a fresh, hearty dinner! According to the official recipe preserved by the Bologna municipality and Chamber of Commerce for "Ragù alla bolognese," milk or cream are actually considered essentials. What I would humbly recommend is a much longer cooking time (3 hours? ), the addition of cloves rather than "Italian" herbs, little or no tomato products (at most, a couple of diced dried tomatoes) and plenty of good stock to keep it moist while simmering. This, along with cloves, is most crucial. This looks so great. Spaghetti with meat sauce was a staple of mine growing up and remains on of my favorite comfort foods. When I went to Italy for my honeymoon, I practically lived off of Pasta Bolognese because it was SO good and yet different at every restaurant. Can't wait to try this. Thank you! you forgot to add back the panchetta. love it anyway. Tried this tonight. Used fresh tomatoes and Monterey Jack cheese (thought I had Parmesan and didn't. Oops). It was great! Very filling. Love your recipes, Jenny! Is there step in this one where you add back the pancetta and remove the bay leaves? Thanks so much!